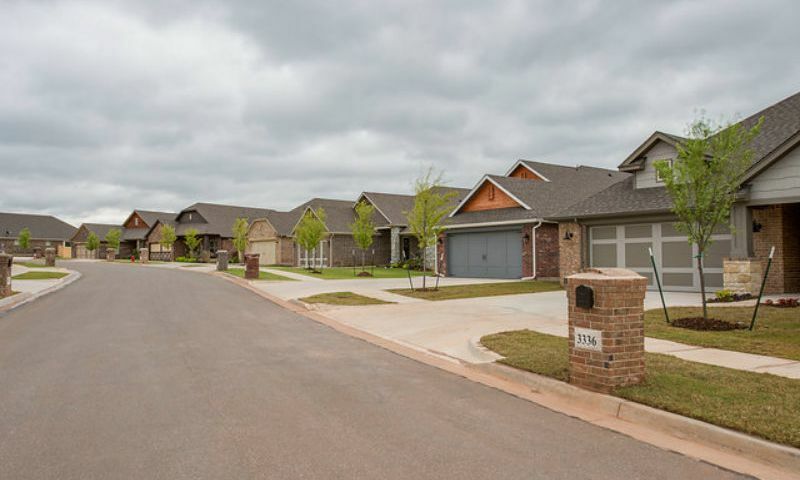 The Springs at Greenleaf Trails is an active lifestyle community in Norman, Oklahoma. This gated community of single-family homes is a fantastic option for homebuyers who want a close-knit atmosphere while being in proximity to big city attractions. Included amenities allow residents to gather together and engage in personal interests. With a stocked fishing pond, community clubhouse, and several walking trails, The Springs at Greenleaf Trails is great for residents looking to stay fit and pursue a hobby in a low-maintenance community. At The Springs at Greenleaf Trails, the community clubhouse provides residents with several different resources. A fitness center is located within the clubhouse to keep homeowners healthy and energetic. There are several multipurpose rooms and lounge areas where neighbors can meet up and chat, or read a good book. On sunny days, residents can lounge on the patio near the outside pool. A stocked catch and release pond is accessible to all residents, with nearby walking trails that give locals the perfect way to relax after a long day. Developed by Landmark Fine Homes, The Springs at Greenleaf Trails offers seven different floor plans. This community offers homes that range from approximately 1,567 square feet to 2,093 square feet. All homes have three bedrooms and two bathrooms and are single level designs. The new floor plans created for this community are designed for those wanting to downsize or busy professionals who prefer a cozy atmosphere when they come home. Homes have open floor plans, perfect for entertaining guests. Social engagements are heavily practiced at The Springs at Greenleaf Trails. There are holiday parties in the clubhouse throughout the year, and an annual gathering brings the community together to mingle and discuss. Potlucks are scheduled regularly in the clubhouse, as well. The homeowners' association provides landscaping and yard maintenance, allowing hassle-free living. Norman, Oklahoma is ideally situated only 25 miles from Oklahoma City. Every day conveniences such as Homeland, Aldi, and Walmart are all about a 15 minute drive. Norman Regional Hospital is less than five miles south from the community. Golf enthusiasts will be happy to know that there are various nearby golf courses within 25 minutes of the community. Norman is home to an art and natural history museum, as well as Lake Thunderbird State Park. For a fun night out on the town, Oklahoma City is the perfect destination with numerous restaurants, sports arenas, and nature centers. For long distance travel, Will Rogers World Airport in Oklahoma City is about 30 minutes from The Springs at Greenleaf Trails. Homebuyers looking for a low-maintenance home in Norman, Oklahoma will be sure to find what they are looking for at The Springs at Greenleaf Trails Homes. There are plenty of activities available in The Springs at Greenleaf Trails. Here is a sample of some of the clubs, activities and classes offered here. Developed by Landmark Fine Homes, The Springs at Greenleaf Trails offers seven different floor plans. This community offers homes that range from approximately 1,567 square feet to 2,093 square feet.All homes have three bedrooms and two bathrooms and are single level designs. The new floor plans created for this community are designed for those wanting to downsize or busy professionals who prefer a cozy atmosphere when they come home. Homes have open floor plans, perfect for entertaining guests. 55places.com is not affiliated with the developer(s) or homeowners association of The Springs at Greenleaf Trails. The information you submit is distributed to a 55places.com Partner Agent, who is a licensed real estate agent. The information regarding The Springs at Greenleaf Trails has not been verified or approved by the developer or homeowners association. Please verify all information prior to purchasing. 55places.com is not responsible for any errors regarding the information displayed on this website.